The PKI 6015 is a powerful and portable jammer ready for operation at any time. With its small size and built-in battery, it is designed for mobile use. Even jamming while simultaneously recharging the battery is no problem. Single frequencies can be activated separately in order to jam only certain required ranges. The PKI 6015 enables you to react flexibly on the requirements on site and provides long operating times due to rechargeable batteries. 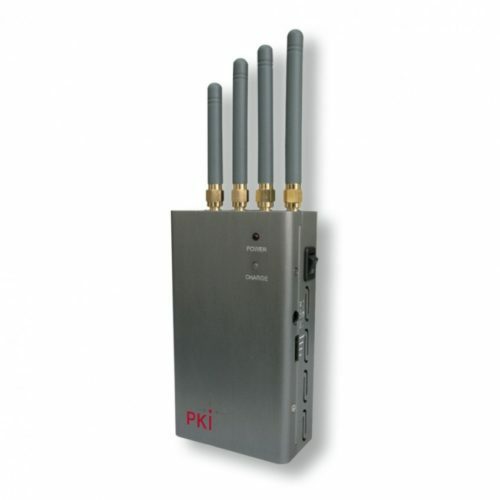 The PKI 6015 is equipped with a solid metal housing and comes with a carrying bag which can be attached to a belt. The antennas are detachable and omni-directional and directional antennas can be deployed as well. Permanent operation is provided even at high operating temperatures due to the built-in fan which prevents overheating. Operating time: min. 90 min.